Pallet Wheel Grease Feeder | Products | Daikin Lubrication Products & Engineering Co., Ltd.
Pallet trolleys and cooler trolleys in sinter plants in ironworks play an important role in continuous manufacturing processes in iron foundries. • Extended Service Life of FacilitiesLubrication with an adequate amount of oil prevents wheel lubrication defects, improves the operating rate of facilities, and also can reduce power costs. The time required for repair and replacement, etc. 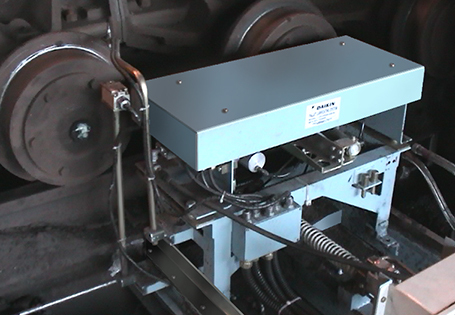 of the trolley due to defective rotation of the wheels caused by defective lubrication and lifting of the trolley is reduced, which improves work efficiency. Automatic lubrication can be easily and reliably performed as this feeder is driven by factory air and trolley moving force. This both saves personnel expenses, and prevents hazardous work and missed lubrication.